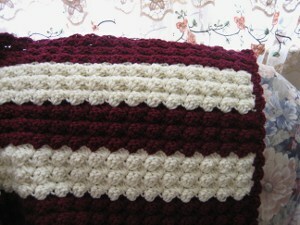 Great for watching the rain fall on a cool fall evening, this Merlot Afghan is a warm and cozy blanket that looks great with almost any decor scheme. Made with a unique angled stitch where each row sits on top of the previous one, this crocheted afghan is soft and substantial in weight, making it great to have out throughout the fall and winter. 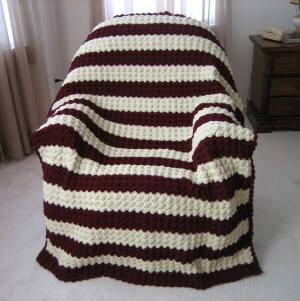 This cozy afghan also makes a lovely gift for the holidays. Shell – (sc, 3 dcs) in space or stitch as indicated. Pattern is worked in multiples of 8 plus 2. Row 1: With merlot ch 154, Shell in 2nd ch from hook, [skip 3 chs, Shell in next ch] across to last 4 chs, skip 3 chs, sc in last ch, turn. Row 2-5: Ch 1, Shell in first sc, [skip 3 dcs, Shell in next sc] across, sc in last sc, turn. Row 6: Repeat Row 2 and fasten off. Row 7: Join aran in first sc, continue with Row 2. Continue pattern for a total of 126 rows as follows: (6 rows merlot, 6 rows aran) ten times, 6 rows merlot Do not fasten off after last row. Work along left side edge start at upper right sc, Shell in sc, Shell in each sc across, sc in first bottom stitch and fasten off. Work along right side edge start at bottom, Shell in first bottom stitch, Shell in each sc across, sc in first top stitch and fasten off.